Obverse: HANC DEVS DEDIT in two lines, crown above, 1648 below. Text around CAROL II D G MAG BE ET H REX. Reverse: Castle gateway with flag dividing PC, OBS to left and cannon protrudes to right. Text around POST MORTEM PATRIS PRO FILIO. History: The Pontefract siege occurred during the so-called 'Second Civil War', a group of royalist rebellions that broke out in 1648. 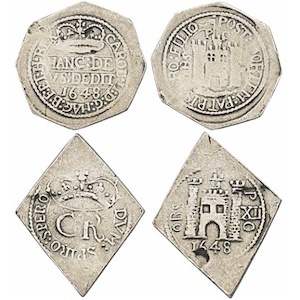 This is a very rare later issue of the coin, and was struck between the execution of Charles I (30 January), and the surrender of the castle (22 March), these later coins were changed to read 'for the son [Charles II], after the father's death'. Date: Second posthumous type, 1648.